Recipe from Zonya Foco, R.D., Author of Lickety-Split Meals for Health Conscious People on the Go! 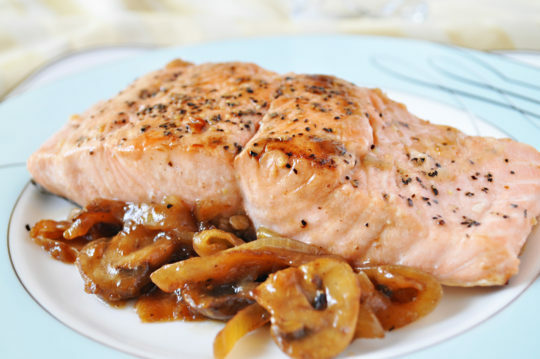 This fish variation on Chicken Marsala is a great way to get delicious and healthy salmon into your diet. You’ll find Marsala wine in the cooking wines/condiments section of your grocery store. Prep the onions and mushrooms. Heat oil in nonstick skillet over medium-high heat; add onion, garlic and mushrooms to the skillet and begin sautéing. Add the salmon filets to the skillet, cooking for 10 minutes per inch of thickness (turn them over midway in the cooking time). Mix together the wine, broth, cornstarch and fresh ground pepper; when the fish is nearly done (you can tell by twisting the center of the thickest part – if it flakes easily, it’s done), add the wine/broth mixture to the salmon. Stir gently, as the liquid turns into a thick gravy within one minute. Serve over whole-grain pasta or brown rice, with steamed asparagus or vegetable of your choice.